Brands featured quite heavily in my Christmas Eve, given that it was raining from the heavens when we walked to the bus stop, they were the highlight of an awful day! 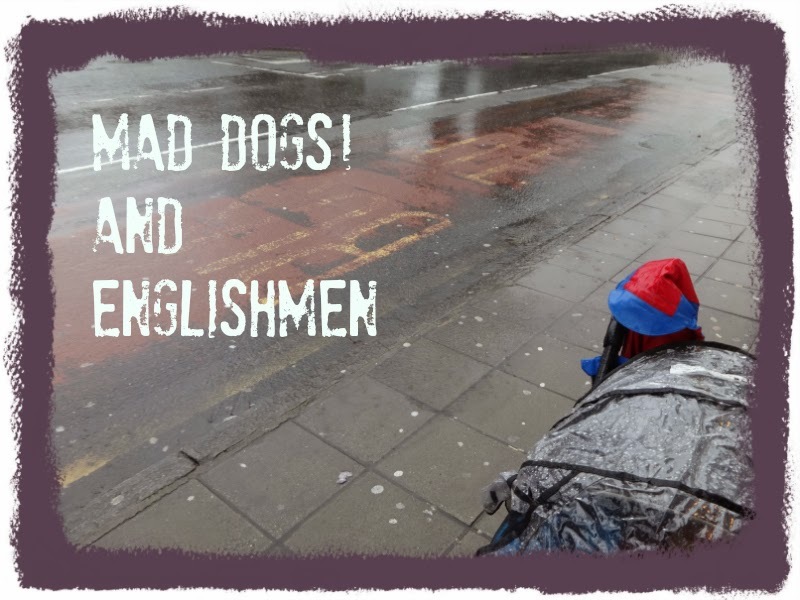 I put the caption "mad dogs and Englishmen" on the photo as I thought they were the only ones who'd go out in the weather we had today (and yesterday), BUT it turns out the origins of that phrase are about going out in the midday sun! Who knew? Not I! So bad enough that I am getting on a bus soaked through, doing shopping I could have done yesterday (that's a whole other story), Aaron halfway through the bus journey decides to play up, so badly I have to restrain him. He doesn't take kindly to his Mummy stopping him from climbing so kicks her - in the tummy. I patiently held him again and again and again and again. In the end I was so mortified, we got off the bus. No, it was not our stop. I decided to walk then, but we were nowhere near our destination, and the whole time Aaron was SCREAMING "I want my bus back" so after walking for 10 minutes we stopped at another bus stop and got the same bus (as in number) but Aaron wasn't satisfied and spent the whole journey saying "this is not my bus" "I want my bus back". I have never known him to be so inconsolable, so off the scale. I wanted to just crawl in a hole and die quite frankly. Once we arrived in "town" I decided a coffee was what we both needed, despite me being way behind on schedule, and that being a bad thing considering most shops were shutting at 5 p.m. Anyhow, the only reason I could afford to have lunch in a coffee shop is because the lovely +CostaCoffee sent me a hamper the other day (a Xmas Survival kit), and it contained a bobble hat (the only thing that kept me warm all day today) and amongst other things a £20 voucher for Costa Coffee. So in we went and look at his sad "in trouble" face! 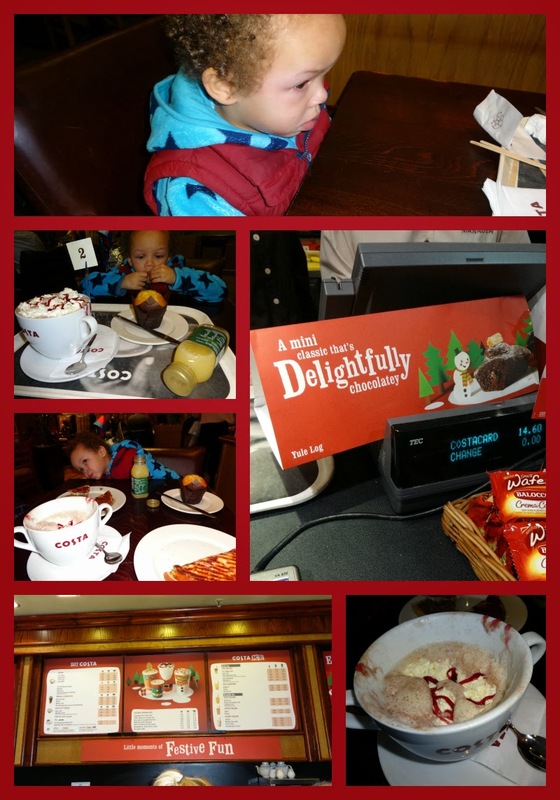 The day I got my Costa delivery in the post, I was talking about it on Twitter, hashtag #CostaChristmas and people tweeted me that the Costa Blackforest Hot Chocolate is amazing so THAT is what you see in the pics above. I went large, which seemed like a big soup bowl, but because we got toasted sandwiches, it turned out I needed every drop of it to wash my food down. Was totally yummy. Was glad of the voucher as our festive coffee lunch came to £14. The service in there was superb! So Aaron, now that he's watered and fed (he had apple juice in there and a toasted sandwich) is now my normal cooperative 3 year old. Phew. Shopping was hell, so I am NEVER having a chaotic Christmas Eve like this EVER again! The other brands that saved my bacon today were Photobox. I ordered a canvas for my Dad the other day, and I did not think it would arrive in time. After a few tweets with Photobox, they ensured it did, and it came today. We were thrilled with the result!!! Fabulous brand who I have been a customer of since 2004 or 5. Yes I was an early adopter of digital photography and I had THE first Sony Cybershot. I got it in Japan before they'd even come out over here. Was £350 though!!! All three bits fitted in a nice branded JLP archive box. Aaron only asked for the boat from Santa, so he will be thrilled with the other 2 sets, which come in the family. I will say the complimentary 2 are from Mummy & Daddy. The other brands that I can't finish without giving a mention are Postman Pat and Poundland. 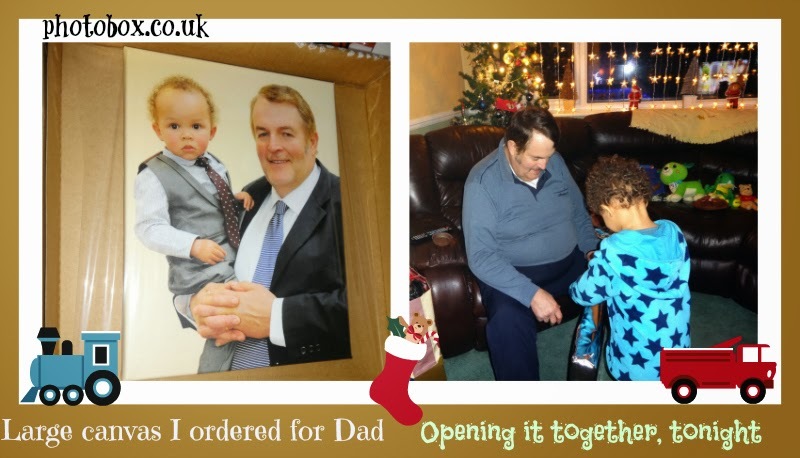 Now that I have seen what a joy it is to get online deliveries, thank you +PhotoBox and +John Lewis I will be doing 99% of the shopping online next year, especially given that being out in the elements all day today was hideous! So I have been telling Aaron for weeks that Santa will come down the chimney, so the above is what our fireplace looks like right now - it's USUALLY full of toys! The 2 big items in the centre are the Jake Lego boat he asked for, and a spiderman costume he also asked for. 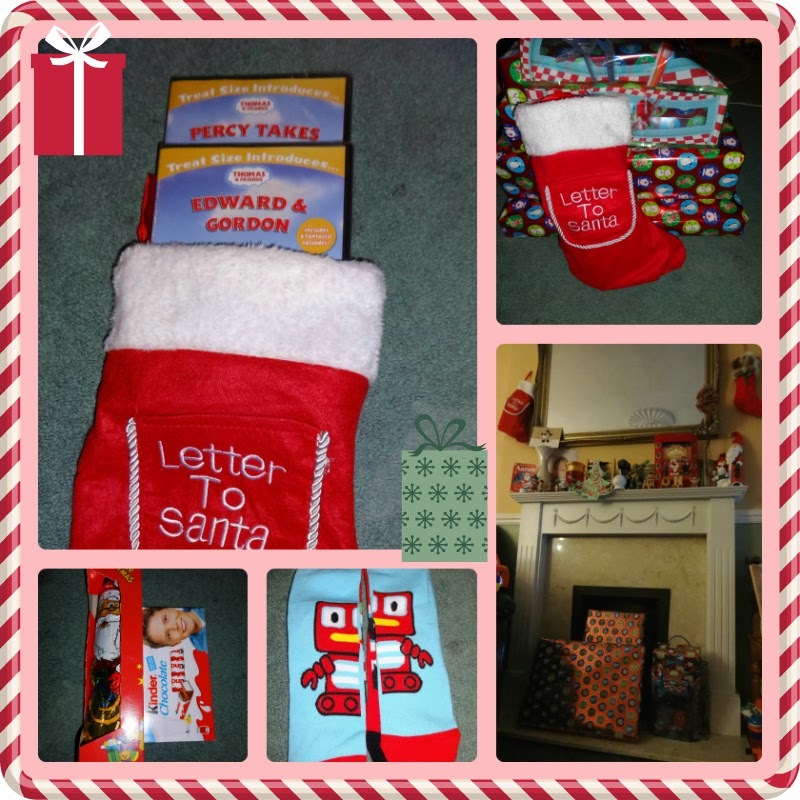 The 2 items to the right (in a "Planes" bag) are the 2 complimentary Lego items in the Jake set, and all of the stocking fillers are in the stocking hanging on the wall, left of the mirror. After not getting any reaction from him last year, when he awoke to a fireplace full of toys, I am hoping tomorrow's will be priceless. With that in mind, it's now 1:56 a.m. and Christmas morning has technically already begun so I best sneak off to bed. #shattered! Merry Christmas to each and every one of my readers. Merry Christmas to you guys! Mad dogs and Englishmen indeed :) I was out yesterday walking to the pub for a mulled wine!! Wonderful! !